With the Defiant Map Pack on the horizon, it has caused us here at Forward Unto Dawn to look back at the multiplayer experience for the entire Halo series. Multiplayer is home away from home for millions of Halo players and has been for many years and hopefully many more to come. We know these spaces better than our own homes, the direct routes from A to B, the shortcuts, the weapon placements, the spawns, the bases and the skyboxes are all second nature to veteran Halo players. We all have our own favourite maps from each game, the maps that we’d like to spend most of our time playing, the ones that flow well, and the ones that we identify as being uniquely Halo. There are many ways to define a Halo map, to make things simple and clear we decided to look back at all of the Halo maps and sort them into three themed categories, Human, Covenant and Forerunner. These categories do not reflect the visual themes perfectly, for example Rat’s Nest and Orbital – two maps from two Halo 3 DLC map packs, are both human themed but each have a separate and distinct visual setting, almost a world apart but despite that, they do share a strong Human-based theme and would not be mistaken for either a Forerunner or Covenant themed map. This is mainly a data dump as we thought the collected information was interesting enough to share. 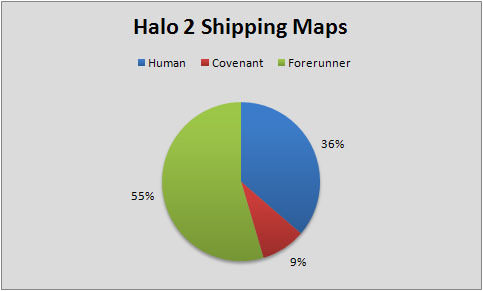 With the original Halo game we see a strong number of Forerunner maps with both Human and Covenant maps coming in second and third place in terms of numbers. This makes sense from the game’s narrative viewpoint. Halo CE established the franchise; it took us into the far future and across alien vistas, against alien enemies and presented us with spaceships and super soldiers. The map selection reflects this tone by mirroring the game’s main visual themes. With have Forerunner bases set in a green canyon framed by the large Halo ring and we with have Spaceships locked together in the cold depths of space. Halo CE on the Xbox did not receive any DLC or post release multiplayer content. Halo did get a few extra maps when ported to the PC but we are not including these maps due to their omission from the original console version. Halo 2 was the first Halo title to recieve additional multiplayer maps after the game had shipped. These releases were set during the time before the standardisation of DLC pricing and content models that the following generation of hardware, the Xbox 360 and the Playstation 3 would define and set. Although Halo 2 is noted as one of the early success models for paid DLC content. From this iformation, a few trends can be spotted. A Halo game’s multiplayer overall mix of themes matches that of the game’s campaign experience. 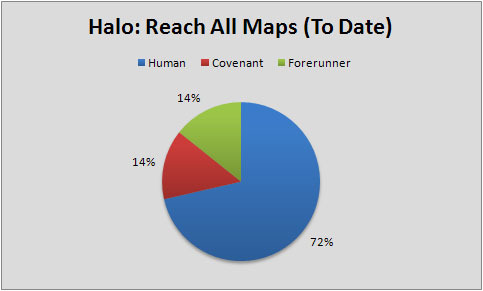 With Halo 2 brining the fight to Earth we see an increase in Human themed maps whilst still retaining a majority of Forerunner themes running strong. Reach on the other hands gives us a more Human centric focus, with Forerunner and Covenant themes taking a backseat. We think it is fair to say that Halo’s multiplayer component mirrors the visual identity of the Campaign experience, even if the specific locations are different. DLC, whilst generally supporting the percentage split of the shipping maps, can deviate with the particular themes used. This is a natural expectation, as DLC gives the developer a chance to try something new whilst giving the player a chance to experience something fresh. 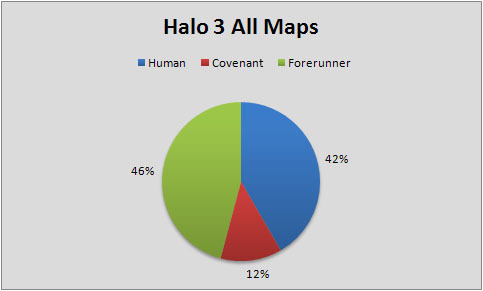 The charts above also show a distinct lack of Covenant themed maps as a percentage of the overall maps that have been available. The last trend is the increase, on a game by basis, of Human themed maps. From less than a third of the original Halo CE map choices to almost three quarters of Reach’s selection with the coming Defiant map pack, it’s clear that Halo has shifted towards giving players environments littered with familiar Human overtones, visuals or aesthetics objects. A map is determined to be good or bad based on a huge number of factors, none of which takes into consideration how the map looks. This gives fans a chance to appreciate even the worst maps on an aesthetic basis. Orbital may be one of the worse maps to every grace an online playlist but hours could be lost spent wondering around the beautiful human space station or looking outside, slung in low orbit over Earth. Some maps, such as Burial Grounds, could technically fall outside of the definitions we have set up in the charts above, but to keep things simple, we limited the definitions to the choose three and carefully selected a category that best fit each map. Our decisions are by no means official or definite, but are what we would consider a best guess approach if not readily obvious. Below is the raw tally data which shows how we came up with the above charts.